Published by Pete on April 21, 2011 in Editorial and Snippets. With the launch of the amazon.de kindle store, Alnpete Press titles are now available in the English Books section. Closed Tags: Alnpete Press, eBook, Germany, Kindle. Published by Pete on March 9, 2011 in Snippets. 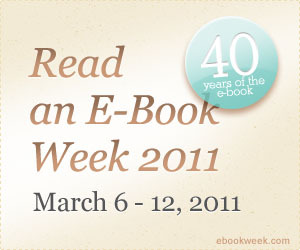 Take the opportunity in this year’s Read an eBook week to read Abiding Evil or Devoted Sisters by Alison Buck, or Library of the Soul by Simon Buck on Kindle. Or if you prefer, Kobo versions of Abiding Evil or Devoted Sisters by Alison Buck, or Library of the Soul by Simon Buck. All currently available at GOOD PRICES. Closed Tags: Abiding Evil, Alison Buck, Crypto da Vinci, Devoted Sisters, Kindle, Kobo, Library of the Soul, Read an eBook Week, Simon Buck. Published by Pete on February 19, 2011 in Snippets. Simon Buck has started his own blog called Concomitant thoughts. We’re providing the hosting but have no editorial input. With a little prompting from various quarters, our bestselling author Alison Buck has just started her own blog. Called Pass the Buck (!) it will be separate from this Alnpete Press blog (although we are happily hosting it for her – but with no editorial input). Have a look. You are currently browsing the Scribbling and scribing weblog archives for the Snippets category.